← NEW Before & After Breast Augmentation Photos! Silicone implants look like a solid mass on x-rays—the machine just can’t see through them. This lack of transparency means that they can hide some of your breast tissue, making it harder for the radiologist reading your scans to find the abnormalities they’re checking for. This is especially true if your implants were placed in front of your chest muscles, rather than underneath them. Saline implants cause some decrease in transparency, but not to as great an extent as silicone gel. There is, luckily, a way to perform a mammogram well despite any interference your implants might cause—a technique called implant displacement views. This method involves moving the implants back against the chest wall and then pulling the breast tissue out from behind it before it is x–rayed. Implant displacement views maximize the amount of breast tissue that can be viewed, thereby increasing the radiologist’s likelihood of detecting any abnormalities they might otherwise miss. Implant displacement views can make all the difference in making sure your mammogram is as effective as possible . . . but the technician and radiologist performing your procedure need to know what they’re looking at before they start! And there’s only one way for them to know what they will be dealing with… you have to tell them yourself. Every time you schedule an appointment for a mammogram, you should let the person on the other end of the phone know that you have breast implants; then, make sure to specifically ask if they have someone there with training and experience in performing mammograms on women with implants. If they don’t—go somewhere else! If they do, still be sure to remind them when you arrive at your appointment the day of that you have implants. Also, bring it up to the technician who is performing your mammogram. You can also ask your regular doctor for a referral to a clinic where they know the radiologists have experience reading scans of breasts with implants. When you’re talking about implants and mammograms, you can’t ignore the fact that there is a small risk involved: Implants have been known to rupture during the procedure, and as rare as that is, it’s important to know that it can happen. Rather than let this fact scare you off from mammograms, however, think of it as yet another reason to go to someone who is skilled in performing mammograms on women with implants—going to an experienced doctor will minimize the probability of a rupture. It’s understandable to be nervous, but keep in mind that in this case, the benefit—detecting cancer early—far outweighs the risk. 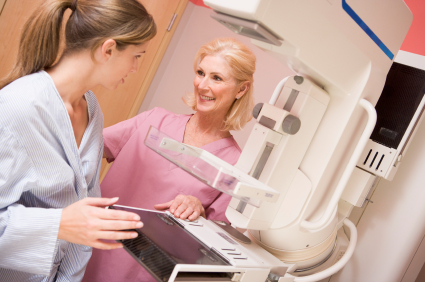 Make no mistake—mammograms are worth the hassle! Studies have shown that mammograms are a valuable means of identifying breast cancer in women who have implants, even though a little extra work is required during the procedure. Breasts with implants need to get scanned just as much as those that don’t have them—so if you’ve been avoiding that mammogram, make an appointment soon . . . and make sure it’s with someone who knows what they’re doing! This is a really good post Usha. Here is something to ponder for those who are researching…Most Radiologists agree that implant displacement views are the best (and easiest) to obtain when implants are placed underneath the muscle. So placement is an important talking point and consideration for you and your perspective surgeon(s). Also note that procedure costs may vary slightly based on your placement choice.